I have two emoji-related pieces out today (since World Emoji Day is coming Sunday–mark your calendars, or, alternately just use the calendar emoji (), which on iOS says July 17). The first is Emojis Reveal How Minorities Tweet the Bible Differently at Christianity Today, which looks at how Bible verses tweeted with darker-skin-toned emoji differ from those with lighter skin tones. I felt the topic differences between the two groups were especially stark (“money management” vs. “long-distance relationships,” for example). I couldn’t find a good place for the following chart, which shows overall which emoji are most associated with darker and lighter tones (as tweeted with Bible verses). Fingers pointing upward (, , ☝) are apparently a light-toned gesture, while bowing deeply () is a dark-toned one. It makes me wonder whether bowing and upward pointing carry similar semantics for different groups. It’s also a little funny to me how fingers pointing every other direction except up (, , ) are more common among tweets with darker tones. And I don’t know what to make of the dark-toned raised fist (✊) vs. the light-toned fist bump (). The data behind the article is available for you to work with if you’re interested. You may want to turn off the filter in the “Tone users” column if you want the complete list of verses and not just the more-common ones. The second post, All the  of the field will , is at the Bible Gateway Blog and talks about how you can now conduct emoji searches on Bible Gateway. The search engine preprocesses your query, replacing certain emoji with English translations. As with all translations, a certain amount of semantic leakage is inevitable, so searching for  uses the literal translation, “skull,” rather than how people often mean it: “death.” I was tempted to translate  (man in business suit levitating) as something related to the rapture, but I restrained myself. Instead, it returns no results. Unknown to me, the previous day, Instagram had published an analysis showing how 40% of Instagram posts contained emoji in April 2015. 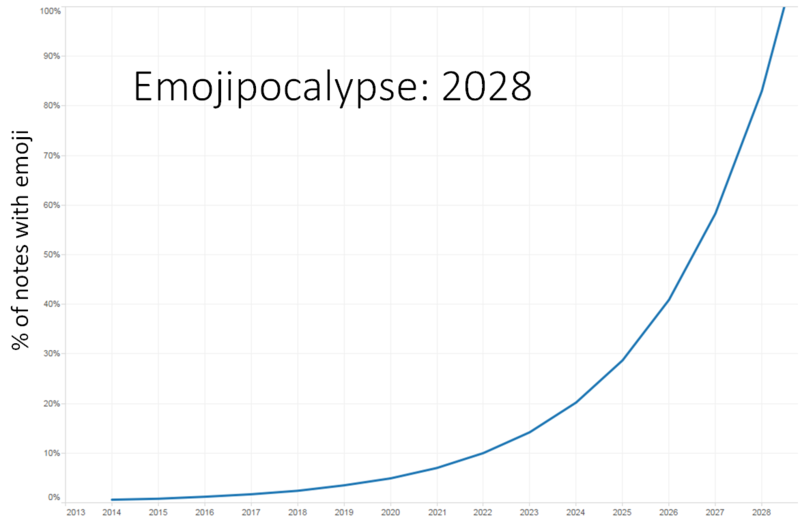 Already they’re well on their way to over 50% of all posts including emoji–some countries (Finland, France) are already there, which in turn means that the emojipocalypse may arrive sooner than expected. “Thou” in particular suggests that people are sharing KJV-based Bible verse pictures with this emoji attached to them. There are two datasets here: one tracks all the Bible verses shared on Twitter (for one day only: about 200,000 tweets), and the other tracks links to Bible websites on Twitter (for all of April 2015: about two million tweets). In both datasets we see that people are far more likely to include emoji when their tweet includes an image than when it doesn’t. So there you go: emoji usage correlates with image usage, at least on Twitter and at least with Bible verses. Separately, the Bible-verse Twitter tracker now keeps a daily total of emoji shared with Bible verses. * No one actually calls it this.